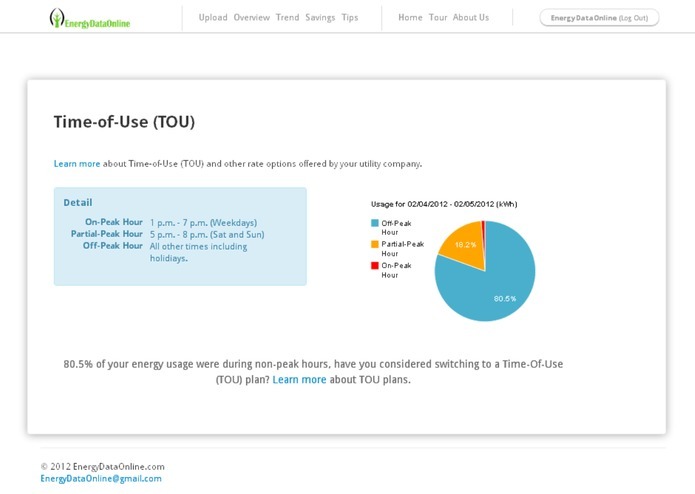 EnergyDataOnline.com helps utility customers to analyze and understand their energy usage patterns and offers customized savings suggestions. In order to access EnergyDataOnline.com, all you need is a computer and internet access. The website is compatible with all of today’s most popular web browsers, but for optimized viewing experience, we recommend using Chrome 10, Firefox 3, Safari 3, IE 6 and Opera 10, or higher. 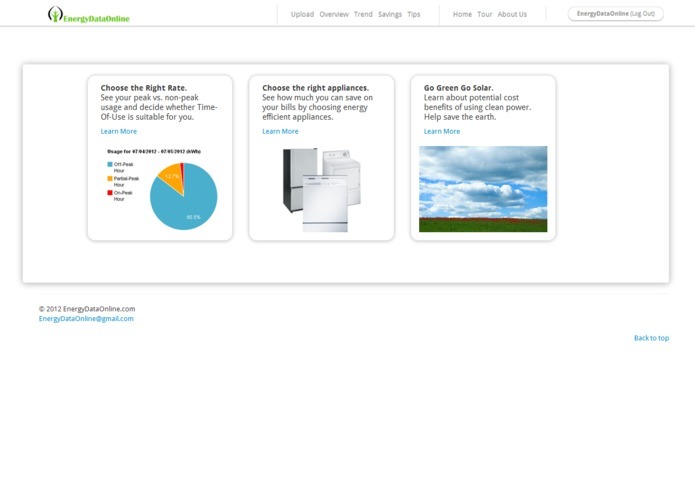 First, log on to EnergyDataOnline.com and sign up for free. Next, upload your Green Button data. 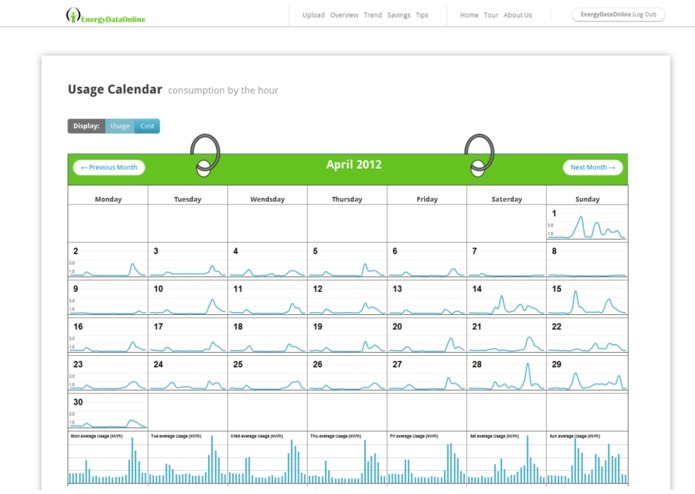 The “Overview” page will plot out your hourly energy consumption and cost data in a convenient calendar format. This special format is intuitive and straightforward. Trends and patterns across days and weeks are easy to spot. On the same page, average usage and cost information are calculated for each hour and each day of the week. 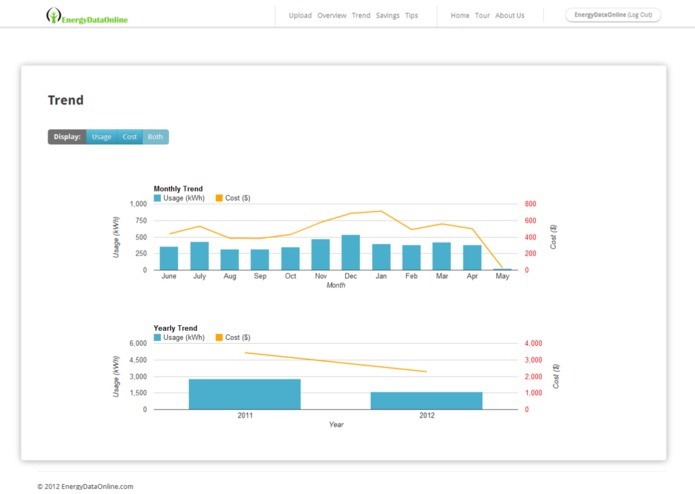 The “Trend” page will feature how your energy usage and costs change year over year and month over month. Knowing how your energy consumption varies over different seasons can help you to identify the most costly habits and appliances driving your energy bills higher. The “Savings” page will provide customized savings suggestions based on your profile. You’ll see how your energy usage is distributed across different time of the day, e.g. non-peak vs. peak hours, as defined by your utility company. By promoting awareness of various rate plans, we hope users will adjust their consumption behavior to reduce peak-time usage. Furthermore, EnergyDataOnline’s savings calculators leverage existing public data and surveys to help customers estimate expected savings they can achieve by upgrading from conventional home appliances to energy efficient models. Last but not least, we offer easy to follow tips to help users achieve significant savings by making small changes. 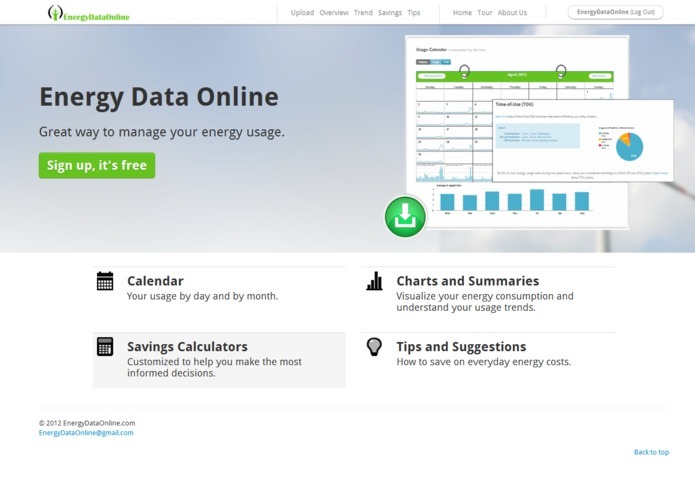 EnergyDataOnline.com is the ultimate place to understand your energy use. Sign up now for free and start saving today.